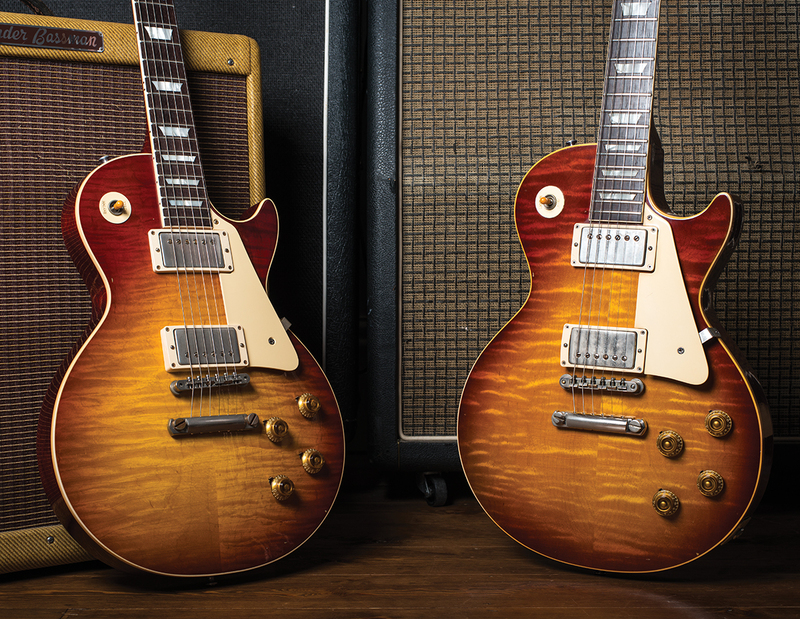 So what are these Gibson Custom Collector’s Choice guitars all about? The basic premise is an ongoing series of limited editions based on specific vintage models. Some of them are name-player guitars, while others have no past profile to speak of, but are superb examples nonetheless. 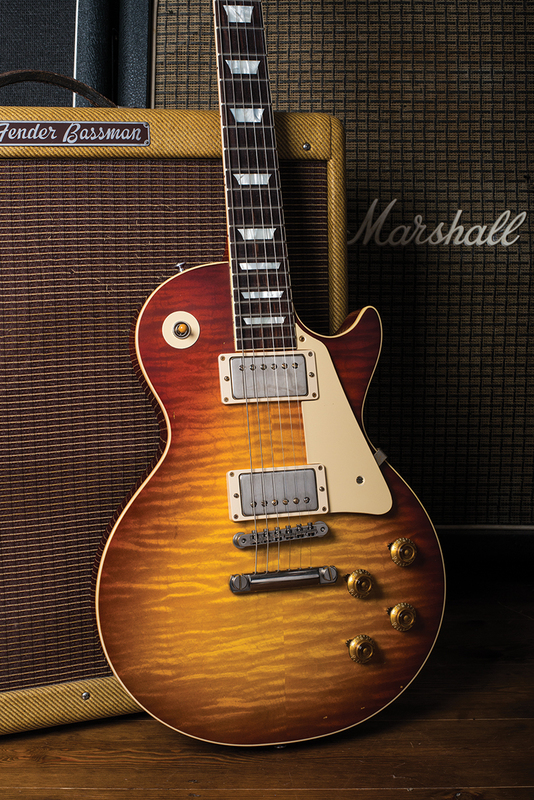 The recently released Minnesota Burst is #39 in the Collector’s Choice Series. It’s based on an original ’59 belonging to private collector Andrew Raymond – who is co-owner of Vintage Guitar Boutique in Shoreditch, London. Andrew has been a good friend to G&B for many years, and he filled in some of his guitar’s backstory for us. The original owner was a multi-instrumentalist named Dan Moline, who bought his Les Paul (#9 1105) from a music shop in St. Cloud in central Minnesota. Dan had been a professional musician since 1939, and he joined a local big band called Buddy Koopmans & His Orchestra in 1946. Believe it or not, the band is still a going concern. Sadly, Dan died around 1990 and ownership of the guitar passed to his son. He kept the guitar until 2001, when it was acquired by a guitarist from Faribault, Minnesota called Dave Miller. Dave had known about the guitar since 1978, and he recalls that Dan “was an amazing guitar player and he mostly sat when he played, so there were hardly any scratches on the back”. A few weeks after buying the guitar, a dealer from the Twin Cities area contacted Dave, bought it from him and sold it on to Andrew Raymond. That’s when the Les Paul crossed the Atlantic and acquired its ‘Minnesota’ nickname. Rub through on the neck shows it has been well played, but this guitar didn’t suffer through the 60s and has never been subjected to any modifications. 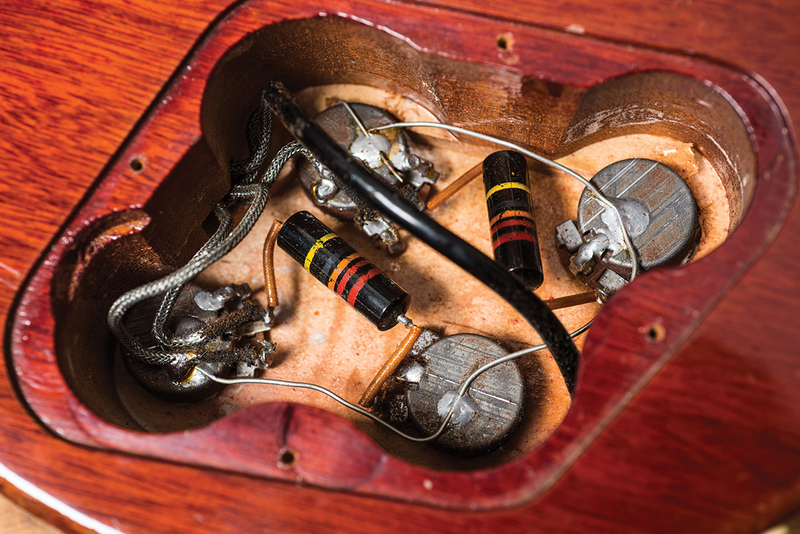 Inside the control cavity, the wiring has remained untouched since the day it left the Gibson factory. 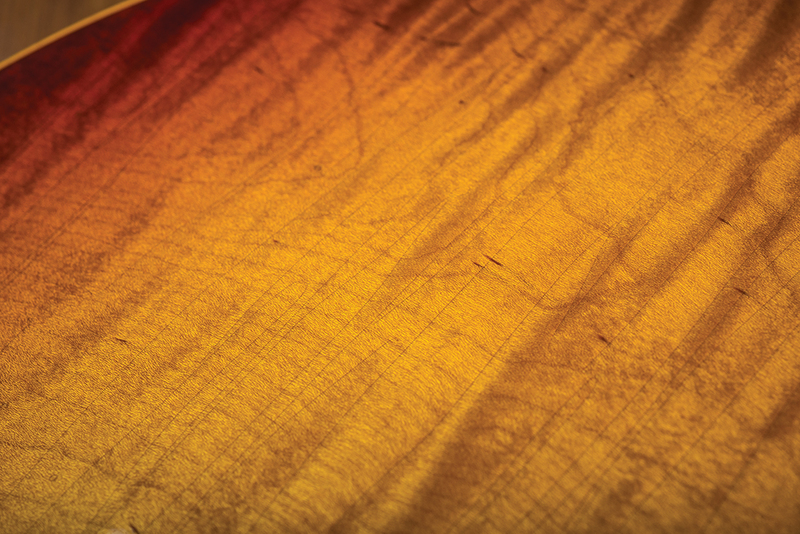 The colour is incredibly vibrant and the edges of the sunburst are a deep reddish brown that is considerably mellower and richer than the red of later ‘tomato soup’ Bursts. 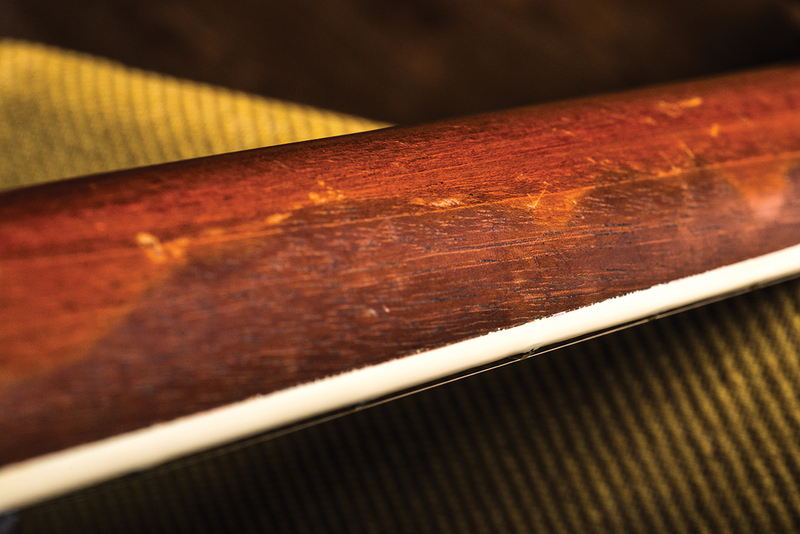 The original frets were the earlier narrow type and were very worn. 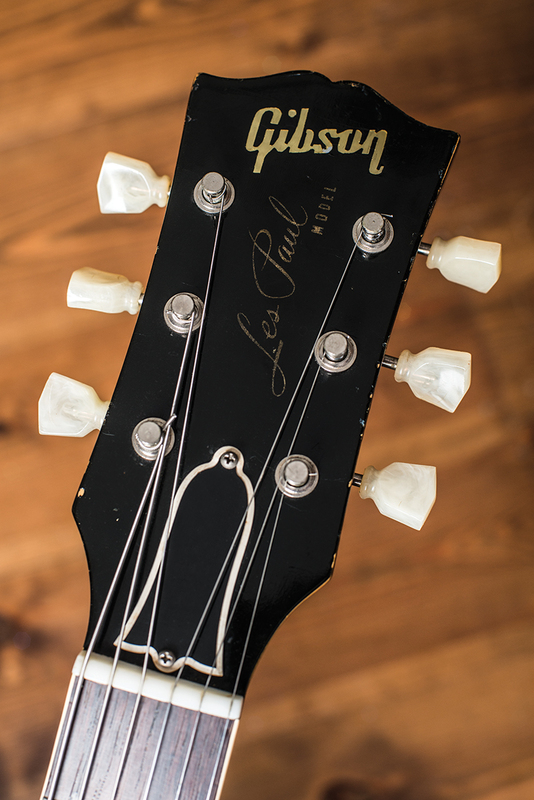 Soon after buying Minnesota, Andrew had a refret done using wider NOS 50s wire from the Gibson factory. The only parts that have been changed are the tuners. The originals had become too stiff – probably through under-use rather than over-use – and some of the buttons had started to disintegrate. Fortunately, they’re tucked away for posterity inside the original case and Minnesota now has a set of Uncle Lou replicas. Over the years, Andrew Raymond has very kindly allowed us to examine and play some extraordinarily special vintage instruments from Vintage Guitar Boutique’s stock. 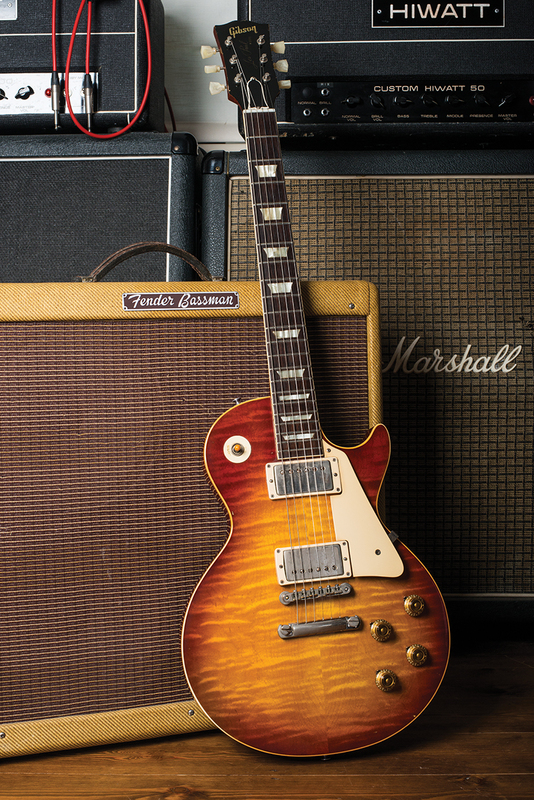 Among them have been several Bursts and the ’57 Goldtop we featured in 2015. This has taught us that while vintage Les Pauls have common features and traits, they tend to have distinct personalities too. For some of the team, Minnesota is the pick of the bunch for its lightness, full but comfy neck profile, easy playing feel and its sweet, almost semi-solid tone. However, Andrew prefers one of his other Bursts and when Joe Bonamassa paid a recent visit he wasted little time in selecting Andrew’s main squeeze to play at a concert in Cardiff. Stretching over the best part of a year, this project took us from the heartlands of rural Wales to London, Nashville and eventually back to Wales. 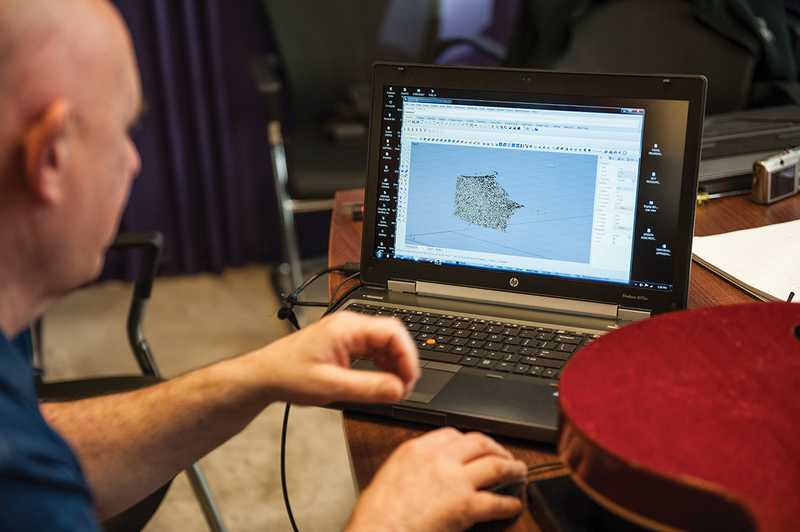 Gibson starts the process by scanning the instrument destined for Collector’s Choice treatment, and for that we headed to London. 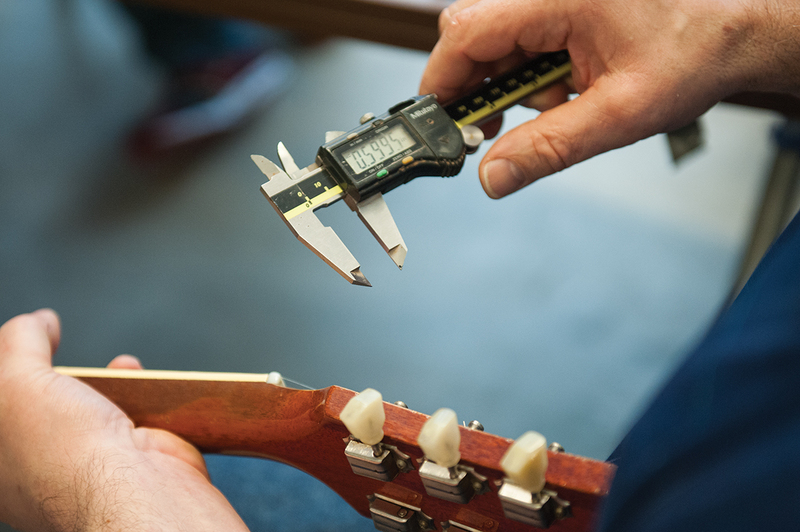 On a fine February morning, we find ourselves sipping coffee with Andrew, Edwin and Historic Program Luthier Matthew Klein at Gibson’s West London HQ. 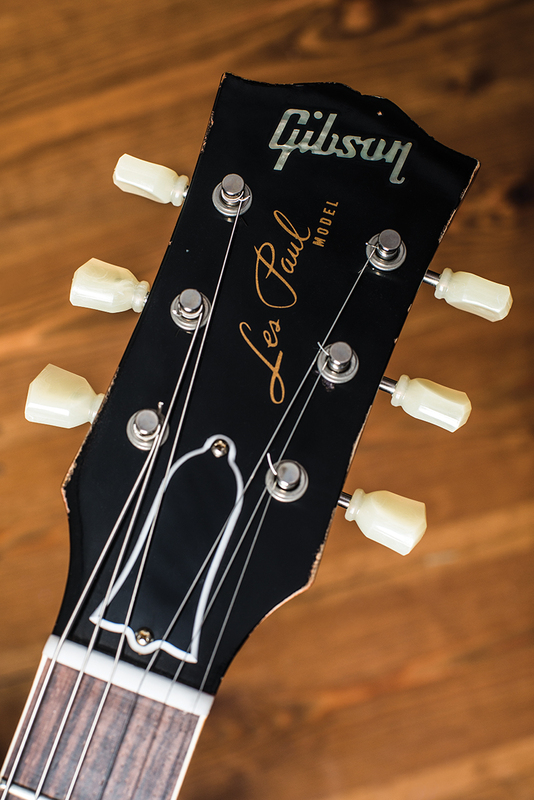 Alongside us are three 1950s ‘Cali Girl’ cases, two of which contain ’59 Les Pauls. On a large table, Minnesota is strapped onto a frame ready for its neck to be scanned. 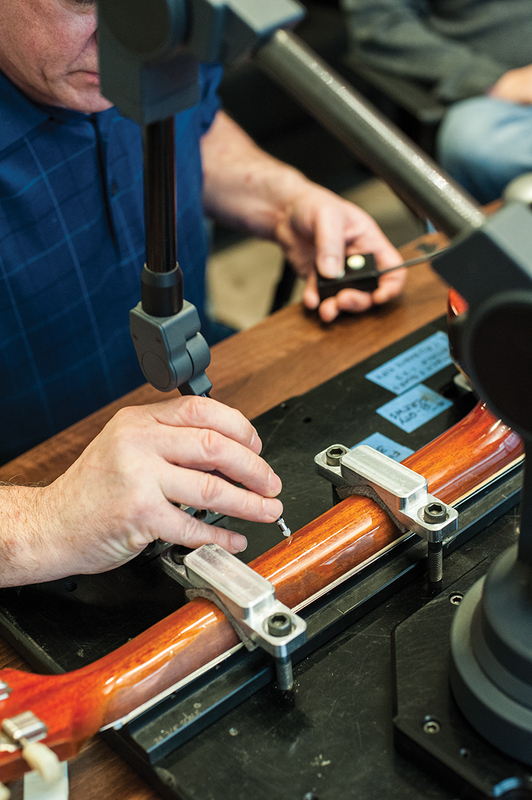 In Gibson’s Nashville facility, the company uses a laser scanner, but the ‘traveling system’ is being used today. Matthew explains how it works: “The arm has five elbow joints and a slick plastic probe that touches the surface of the guitar. The system notes the position of each elbow joint, so each reading is analysed relative to a ‘home’ position. The system works it all out to determine the exact position of the sensor and the positional information is fed into a computer program that draws out a 3D representation of the neck. We ask if machine-carved necks are indistinguishable from the originals, and Matthew assures us they are: “The only areas that can deviate with our processes are the transitions. It’s very easy to knock a corner off with even the finest sandpaper and change the character, but so far as the playing surface, heel and back of the headstock are concerned it’s correct. 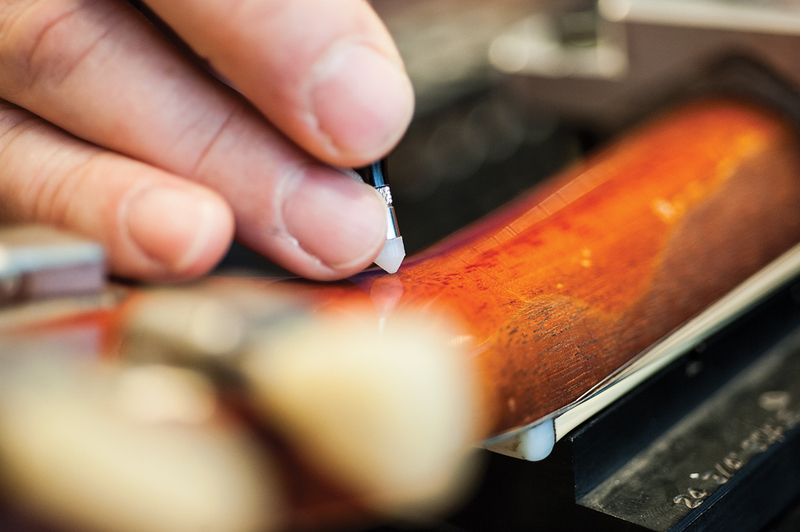 “The difficulty is if a corner is too sharp the buffing machines will rub through the lacquer, but if it’s too rounded it won’t look like a Gibson. 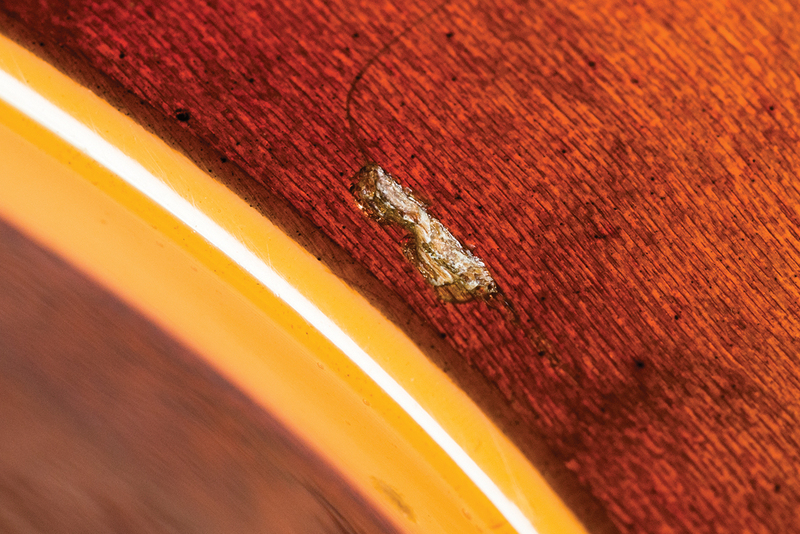 Since most of the original Bursts were lighter than later ones, does Gibson shoot for a vintage-correct weight? Edwin selects and buys the wood, so he gives us some insights. “Most of the stuff we’re doing now is very light mahogany, and part of that is the fact that it comes from Fiji as opposed to South America,” he says. The Collector’s Choice models are replicas of old, well-played instruments, so Gibson uses a variety of techniques to achieve an aged look. Edwin kindly shares some secrets with G&B: “We’ll oxidise the wood using chemicals that are common in the woodworking industry, and the lacquer checking is done with razor blades. Although Fender is starting to do some razor stuff, over the years they’ve mostly sprayed something called airplane lacquer, and it dries incredibly hard. Then they’ll use compressed air to crack it. The problem is it shatters the lacquer, and that’s not realistic-looking for us. While we’re chatting, Matthew finishes the scanning procedure and hands Minnesota to Edwin for further measurements while he backs up the data. In contrast, Edwin’s approach is reassuringly analogue as he takes careful measurements all over Minnesota’s neck and body and writes down everything down in a notebook with a biro. Part of the documentation process involves removing the control cover and taking pickup readings. The results are surprising, with the bridge pickup reading a fairly standard 7.59k but the neck topping the scale at 8.8k. According to Edwin, it “could be the hottest PAF ever”. This leads into a discussion about current production PAF replicas and capacitors, which are clearly subjects close to Edwin’s heart. 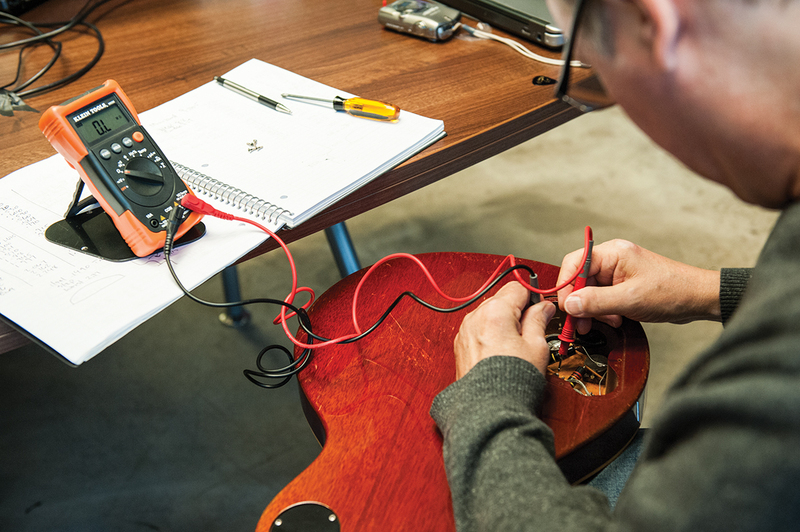 “Usually, what I’ll do on these lines is measure the output of the pickup and use whatever’s closest to that. When we did the Jimmy Page model, that was the first time we made a specific pickup for a guitar. I asked him if he wanted the same pickups used in the ’91 model and he said those were the worst pickups ever. So I measured his vintage pickups, and I wound something that was similar to what his guitar sounds like currently. “So our Custom Buckers are loosely based on the pickups I made for him. The coils are mismatched and they’re unpotted, but the output is a little different. The range we use goes from about 7.6k to about 8.3k. In recent years, a sizeable replica parts industry has developed. Gibson is now making many of its own parts, and they are more vintage-accurate than ever before. After all, it’s a point of pride because Gibson designed and made the parts in the first place. Edwin takes us through the recent changes. “The tailpiece is aluminium and it was the first vintage part we reissued. Since then, we’ve done the bridges and saddles. We buy in our machineheads, but in 2015 we re-tooled our pickup covers, the plastics and everything. We decided we wouldn’t guess anymore about what the parts should look like or what they were made out of. We even have the materials analysed in a lab, because that sort of information doesn’t really exist at Gibson in the engineering notes. “Lou Gatanas, of Uncle Lou’s Classic Guitars, and I worked really hard together on the plastics, pickup covers and the parts. So from 2015, the switch tips have been Catalin and the flat plastics are ABS, like the originals. We did 3D scans of a set of original pickup rings and they’re butyrate like the knobs. The knobs are hand-painted and the gold that’s on them is the same gold that we use on our Goldtops, just like Gibson did in the 50s. They’ll even fluoresce under black light. Edwin and Matthew fly back to Nashville the following day and the waiting begins. At this point, none of us has any idea how long it will take or even when the first prototype will materialise. Fortunately by early May the prototype has arrived. Andrew gives us the call, and it’s a classic case of ‘close but no cigar’. On the plus side, the first prototype’s neck is a dead ringer for Minnesota’s and has a similarly lightweight and easy-playing feel. The most obvious difference between the real thing and first protoype is that the outer edges of the sunburst are too red and ‘tomato soup-y’, and the binding isn’t yellow enough. We also notice that Gibson hasn’t reliplicated the wear on the bass side of the neck. Photos are taken, emails are written and Andrew sends our feedback off to Nashville. Edwin clearly got lucky on a timber-buying trip soon after and we didn’t have to wait too long for Minnesota to go into production after all. 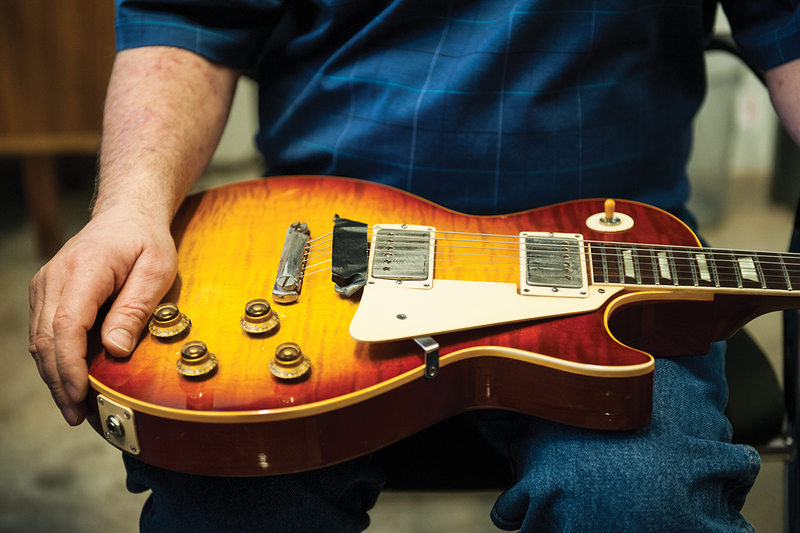 G&B editor Chris Vinnicombe paid the Gibson Custom factory a visit while he was in Nashville covering Summer NAMM in June, where there were Minnesota Bursts in final assembly that very day. By July, Collector’s Choice #39 had hit the shops and Andrew had taken possession of prototype number two and the very first model to roll off the production line. Although we now turn our attention to the production model, what follows differs slightly from a regular G&B review. We always assess build quality, playing experience, tone, aesthetic appeal, and we’ll cover those same bases here. However, the crucial difference is that the production model will be judged against the guitar it’s purported to replicate, as well as on its own merits. This begs the question ‘is it fair to compare a £7,599 guitar with one that’s worth about as much as a suburban semi-detached house?’. We think it’s justified because all of the raw materials that went into making Les Pauls back in the 1950s are still available. The vertigo-inducing value of vintage Les Pauls actually comes from their association with seminal recordings and their extreme rarity rather than solid gold hardware, diamond inlays or other such exotica. You might say that it’s all about the tone, because it’s popularly imagined that age has somehow ‘seasoned’ the original instruments. But we’re not convinced that’s a valid argument. 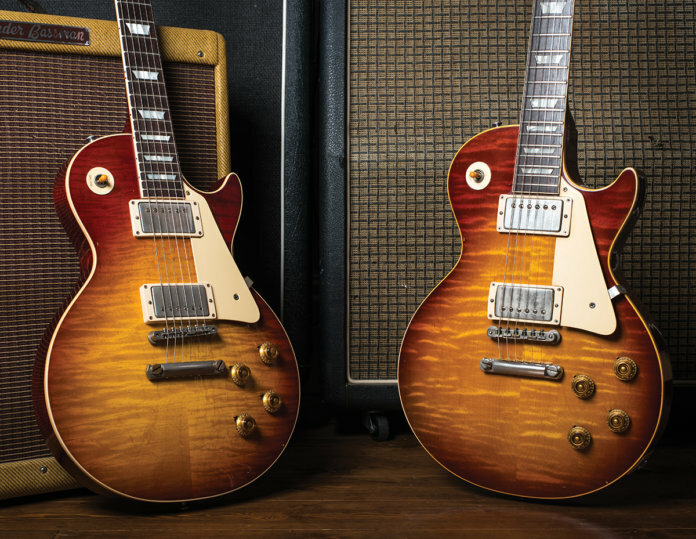 The Les Pauls that Peter Green, Eric Clapton and Mike Bloomfied played in the 60s were less than a decade old, yet the records are proof they sounded incredible. Besides which, there are plenty of 70s guitars that sound just as dull and lifeless now as they did when new. Age alone guarantees nothing. If the Beano Burst resurfaced tomorrow, we’re not convinced it would sound better now than it did 50 years ago. You could get into minutiae such as neck profiles, weight and appearance and you’d be on safer ground. The real Bursts we’ve played have knocked our socks off – not because of their value but because they feel utterly fantastic and the PAF pickups from that era have never been bettered. Of course, the patina and historic significance intensifies the thrill, but they’re sublime guitars because of the way they were made in the first place, not because of the way they’ve aged. 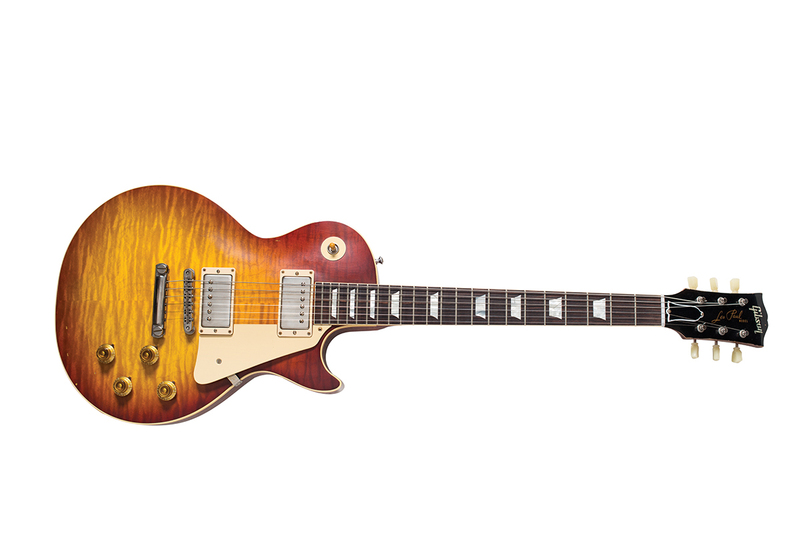 Gibson certainly nailed the sunburst, and the figuring closely resembles Minnesota’s. Short of applying a photo transfer on the production models, it couldn’t have got much closer given the vagaries of natural materials. The edge shade is really quite remarkable, but the centre is just a tad yellower and the binding a bit lighter on the production model. Minnesota’s clear coats are more amber, but a few hours’ sunbathing would surely help the production model to close the gap. Although restrained, it has extra lacquer checking that’s more obvious. Minnesota’s checking can be seen only from certain angles, just like its flames, which Gibson has got just right. Without stain to make the grain pop, the top can look quite plain from some angles, then as you twist it and the light bounces from a different angle, the flames leap right out. This pseudo-holographic effect is a hallmark of the real deal, and clearly Gibson can still deliver the goods. The company has replicated the wear pattern on the treble side but not the bass side of the neck. There’s a large lacquer-free patch, and the wood feels as if it has a protective coating with a slightly greyed-up look to simulate oxidised timber. 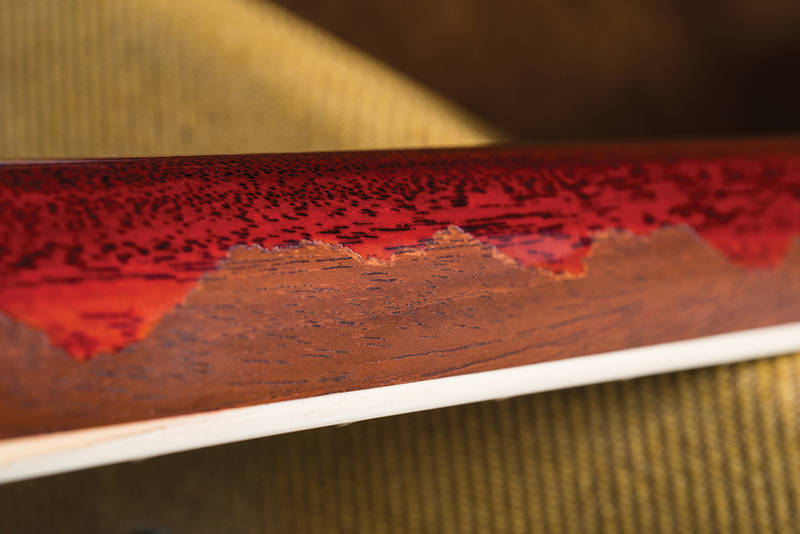 Minnesota has more dark/light contrast between the middle and end areas of the neck, but the deep cherry colour looks gorgeous and the restrained ageing on the back is confined to lacquer checking and a few minor dents. This is in keeping with the original, which is in great shape and has no buckle rash. 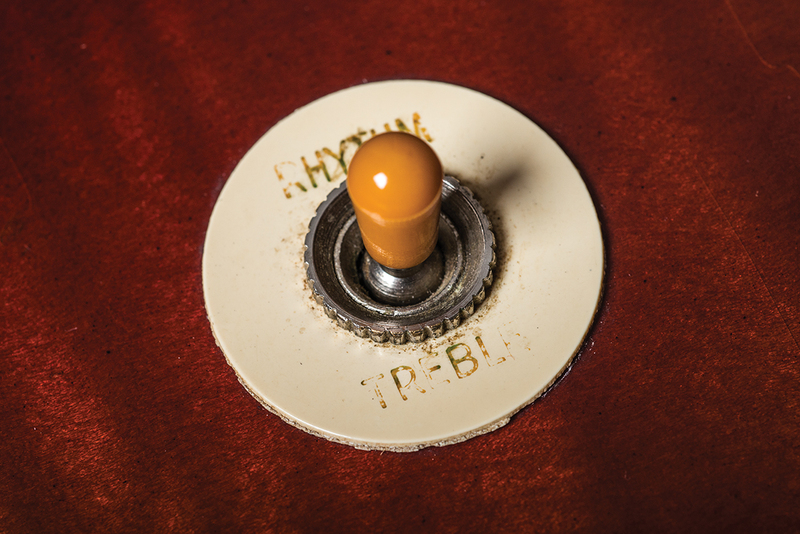 Although the production model’s plastics and hardware show minimal signs of distress, Minnesota’s original knobs appear virtually new and the hardware is only a good buff-up away from looking the same. Visually, Gibson has done an impressive job, and although on close inspection the production model looks aged rather than genuinely old, there were still several comedy moments during photography when we had to check the serial numbers to distinguish Minnesota from the prototype and production model. Moving on to the feel, it’s really no exaggeration to state that if blindfolded and handed all three guitars in turn, we don’t believe we could tell which was which from the neck profiles alone. Although the measurements might reveal minute differences, the necks are, for all practical purposes, identical. The guitars also feel very similar, with a nicely worn-in quality and slinky action. Acoustically, Minnesota falls bang in the middle between the second prototype and the production model, with a meaty low-mid growl, slightly recessed mids and airy treble. The prototype has the airy treble quality without the growl, while the production model does the low-midrange thing without the wide-open treble chime. Minnesota also has a resonant and almost semi-solid quality, with very long sustain. Single notes played high up the neck sound sweet and have a lot of body behind them.The production model has a fatter midrange tone than the prototype and it combines fat but crisp low notes with tons of sustain but not quite as much twang. If we were reviewing the production model on its own, we’d be over the moon with it because it’s an outstanding Les Paul that more than holds its own with the vintage examples we’ve played. The prototype sounds a tiny bit closer to Minnesota unplugged, with slightly scooped mids and a more delicately nuanced treble. But we’re really splitting hairs because all three have outstanding natural tone. And while they all sound different, we can’t identify any one of them as being clearly superior to the others. We’ve dwelt on the playing feel and acoustic tone because there’s nothing much you can do to improve those, and we’re pleased to report that the production model passes with flying colours. 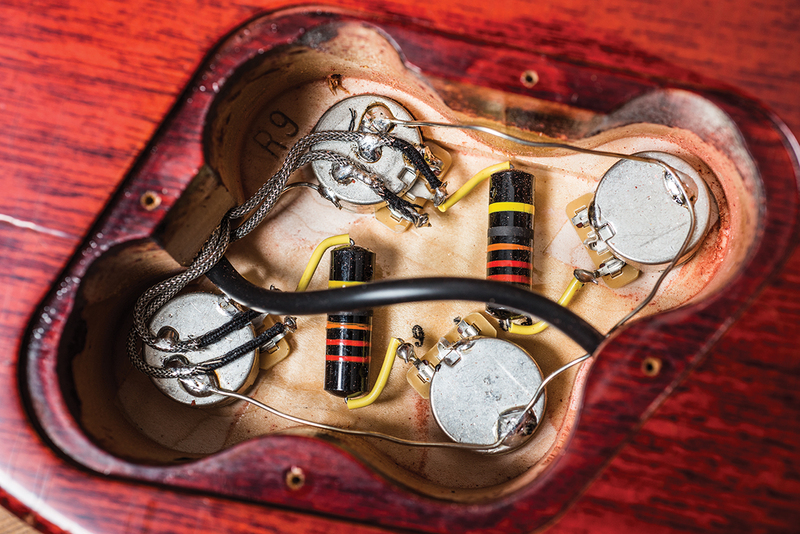 It is perhaps all too predicable that Minnesota gets its nose in front when amplifiers are involved, so given the extreme similarities in playing feel and acoustic tone, the focus of attention shifts to the pickups. The production model has a muscular, aggressive midrange but it’s comparatively rolled off in the deep lows and upper harmonics. Nevertheless, these pickups have a very articulate bite with a discernable bloom, but the ethereal shifting harmonic thing synonymous with original PAFs doesn’t quite happen, perhaps because the ‘air’ frequencies in question aren’t really there. The Custom Buckers clean up without losing clarity, but you can’t get them to do woody jazziness, jangle or a ‘Tele on steroids’ trick. The production model has more of a cocked wah rock voicing, whereas Minnesota is a better all-rounder that’s thicker, clearer, more dynamic and versatile. The production model would be a stellar guitar for a rock gig, but Minnesota could get you through a set of covers, blues standards or even jazz. They’re just as good as many of the boutique PAF pretenders we’ve tried. 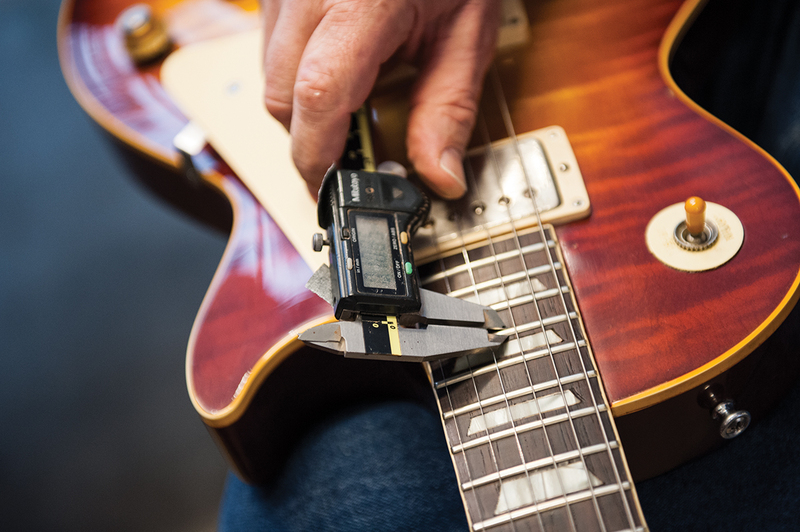 There are a handful of PAF replicas that sound closer to original 50s units – we discovered that installing a set of Monty’s PAFs can send the sonic performance of a Collector’s Choice Les Paul into the stratosphere when working on a friend’s Greg Martin Collector’s Choice #15. Considering their price, you might argue that owners shouldn’t be obliged to ‘upgrade’ Collector’s Choice instruments at all. However, the point is that they’re not. Without the original Minnesota and the Monty-fied Greg Martin on hand to compare, it’s doubtful that we would feel anything was missing here. It was certainly worth the wait, but is it worth the money? If you can afford it, you could consider this model either an expensive option or a substantial saving. 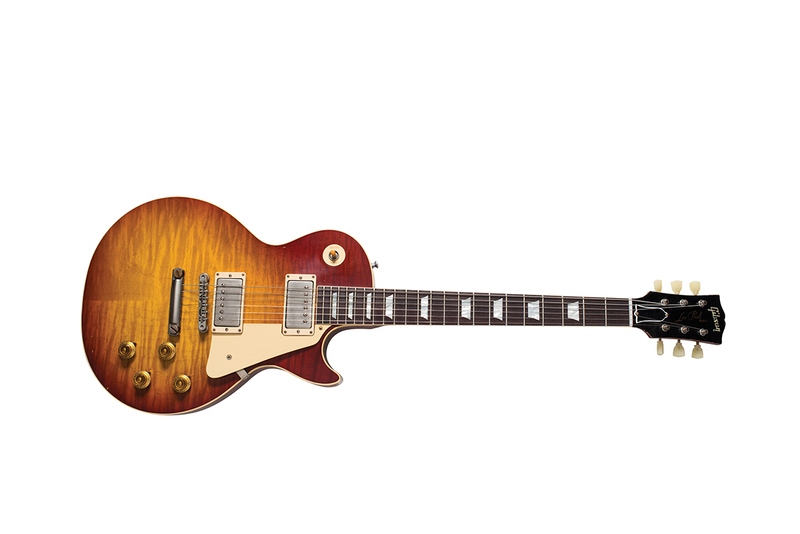 Either way, it looks, feels and sounds like the real deal, and it’s every ounce a real Gibson. It seems they do make ’em like they used to after all. Special thanks to Andrew Raymond and Vintage Guitar Boutique for making this feature possible. Visit the store online at vintageguitarboutique.com to see a fine collection of vintage and new instruments on sale.